Also known as: rackmount lcd monitor, rack mount LCD monitor, rackmount tft monitor, fixed rackmount lcd monitor, tft rackmount lcd monitor, flat panel monitor, rack mount monitor, active matrix monitor. The CRYSTALMON™ TFT/LCD Monitors provide the industrial or commercial user with superior picture quality and a variety of mounting options such as rack, wall, and tabletop. They support true plug-and-play functionality and do not require any additional video drivers or interface adapters. 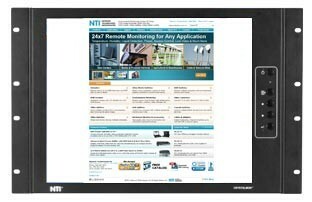 Available with an industrial 17" (432 mm) TFT/LCD flat panel monitor. Adjust height, tilt and rotation of monitor for best viewing position. Keyholes for mounting to a wall. Compatible with NTI's LCD arms. Space-saving. Extra rackmounting space available behind the monitor. 7RU (12.25" (311 mm)) high. VGA video via female 15-pin HD connector. DVI video via female DVI-D Single Link connector. Includes 6-foot (1.8-meter) VGA and 6.5 foot (2 meters) DVI video cable. AC input: 110 or 220 VAC at 50 or 60 Hz via AC adapter.